The Book Chook: Children's Book Review, Look, a Book! Children's Book Review, Look, a Book! Look, A Book! 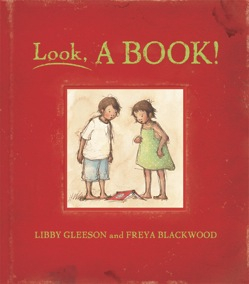 is a prime example of what happens when you put two brilliant and creative people together, in this case author, Libby Gleeson, and illustrator, Freya Blackwood. This children's picture book was published by Little Hare Books, (an imprint of Hardie Grant Egmont) 2011. Look, A Book! You never know where it might take you. When two ragamuffins stumble across a book in the dust their world begins to change. The familiar becomes fantastical, the mundane becomes magical, and a fractured community finds a focus. Set in a dreary, underprivileged, contemporary world, Look, A Book! is an exhilarating whirl through the magic of imagination that leaves the reader in an vertiginous trance. the dust and the dog and the rain. Gleeson's writing in this book is spare, leaving lots of room for Blackwood's interpretation and our own imaginations. For instance, when the narrator warns the children to take care the rain doesn't fall on the book they find, we see the kids sheltering under a tea-cup, then paddling away in it. Elements we see on one page are magically transformed on the next. Blackwood's watercolours retain pencil sketch lines, giving the illustrations not only detail but life and movement. You will gain an idea of the range of Kate Greenaway winner, Freya Blackwood's work on her website. I love that Look, a Book! celebrates what reading can do for us, and believe kids will too. Find more Children's Book Reviews on The Book Chook by clicking Reviews in the right sidebar. Find children's picture books about books in this list.